One of the Great Features in Winter time in Japan, is the light illuminations. Especially, around Tokyo has many beautiful illumination that has millions of LED light that creates the art of the night. 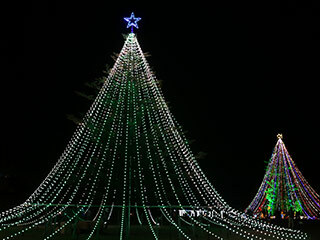 Christmas at Miyagase (宮ケ瀬クリスマス) has one of the best winter illumination in Kanagawa. It's been over 30 years since they lit the night of Lake Miyagase with over 600,000 LED lights. The main features are the 315m long suspention bridge with lights and a giant Christmas tree. There are many food stands, live music events will be held in this illumination. Admission: Free Bridge is 300 yen. 0. at Odakyu Atsugi Station. 1. use local bus to Miyagase.